No one is for certain where exactly the vitamin packed “Golden Apple”, as the natives of Northern India often referred to lemons, came from. Lemons are believed to have originally come from India and China. 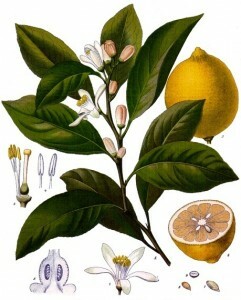 Those in Northern India considered the lemon to be a valuable trade as they prized the lemon for its unique flavor in cooking. The Chinese used them as an antiseptic for wounds and as an antidote for poisons. The lemon eventually made its way to Egypt and the Mediterranean by way of the ancient Jews. Lemons were introduced to the Islamic gardens as an ornamental plant while the Egyptians used the leaves of the lemon tree in a drink known as Kashkab. Kashkab was a beverage made of fermented barley, mint, rue, black pepper, and Citron (lemon) leaf. By the thirteenth century the trade in lemon juice had grown considerably. Records of a medieval Jewish community in Cairo show that bottles of lemon juice, Gatarmizat, made with sugar were consumed locally and exported. Scholars believe this lemon juice to be an early version of lemonade. By the time Christopher Columbus made his second voyage in 1493 the lemon tree was well established across the Mediterranean and Asian continents. On that voyage Christopher Columbus brought with him the seeds of the lemon tree, among other citrus trees, to the Island of Haiti. The Spaniards also brought a crew populated with scurvy (a nutritional deficiency) to the New World. Ironically they were carrying the vary fruit that could have prevented the disease. The antidote for scurvy was not published until British naval surgeon, James Lind, sanctioned the use of lemons in his “Treatise on the Scurvy”, in 1753. Nonetheless, his advice to give citrus fruit to the sailors was not implemented by the Royal Navy for several decades. By 1563 groves of citrus fruit including the lemon were introduced along the South Caroline coast and Saint Augustine Florida. Today California and Florida remain the largest producers of lemons in the United States while India is the world’s largest exporter of lemons. Lemon juice is a complementary flavor in many fish dishes. Lemons are often used in marinades with poultry or red meat. They are also used to flavor steamed vegetables and lend flavoring in baking decadent desserts, cakes, pies, tarts, icings, puddings, fillings and candies. Mostly lemons are used as a garnish for iced beverages or hot tea. Besides cooking, lemons offer many healing properties. Lemons are considered a diuretic and may be useful to help flush toxins out of the body. Drink a regular tonic of lemon juice and water to cleanse the liver. It is also thought to help dissolve gallstones, treat infections, asthma and arthritis. Mix lemon juice with hot water to aid in digestion and help cure nausea, heartburn, constipation, worm infestations and relieve hiccups. Mix lemon juice with hot water and honey to relieve a sore throat. Mix lemon juice and cranberry juice to help cure a bladder infection. Use lemon essential oil mixed with massage oil to aid circulation. Soak fingernails in a mixture of water, baking soda and lemon juice to clean nails and cuticles. Wipe cutting boards with lemon juice to sanitize and get rid of odors. Use lemon juice and vinegar to white underarm stains and ring around the collar. Then place in the sun. Brighten laundry whites. Add 1/2 cup lemon juice to the wash cycle of a normal-size load. Squeeze lemon juice on sliced apples or pears to eliminate browning. Shine stainless steel and clean glass shower doors. Spray lemon juice on your hair then go out into the sun for natural highlights. To juice a lemon keep them in a bowl on the counter rather than in the fridge. Press down and roll the lemons on your cutting board before juicing.